The inaugural entry in the Cthulhu Classics series of reviews began with perhaps the most important scenario ever published for Call of Cthulhu. The follow up to the review of Trail of the Loathsome Slime was to be Grenadier Models Inc.’s The Horrible Secret of Monhegan Island, but unable to locate my copy, I have instead located my copy of Nightmare in Norway. Just as the review of this scenario is the follow up to the review of Trail of the Loathsome Slime, the scenario is itself a follow up to Trail of the Loathsome Slime. Written by the same author, Marcus L. Rowland and published in 1985, it was also the second scenario from Games Workshop for Call of Cthulhu and the penultimate entry in a series of scenarios that would end with the brilliant Queen Victoria & The Holy Grail, also written by Rowland, but for the superhero RPG, Golden Heroes. As a scenario, Nightmare in Norway primarily consists of a description of Olsen’s Lodge, its staff, and its guests, as well as the true cause of Edward Cleary’s death and the threat that will attack the lodge several days into the investigators’ stay. What the investigators do between then and the attack is up to the players. There is the skiing of course, but some of the other NPCs have their own agenda and the investigators will need to look into their actions if they are to determine the identity of the blackmailer. With several days of this for the investigators to spend in and around the lodge, the Keeper will need to flesh out the various NPCs as they are lightly sketched out. The strike upon the lodge, when it comes, would seem to be the ‘climax’ to the scenario. It occurs in spite of the investigators’ actions. In fact, their actions are irrelevant to this plotting as there is no way in which it can be prevented, and the only advice for the Keeper is when and to an extent, how to stage it. Further, what is interesting about the Mythos threat in Nightmare in Norway – the Norwegian equivalent to ‘Bigfoot’ – is that almost no one is aware of it before this climax and consequently there is almost no way in which the investigators can determine its existence before the event occurs. The problem is that this climax is not the actual climax to Nightmare in Norway. As written, it is suggested that the one of the threat’s number escape the aftermath of the attack on the lodge and return to its lair. The investigators are expected to track it back to its lair and there confront it. The question is, what happens if the players decide not to do that? What happens if the investigators barely survive the attack, but drive off their attackers? What if they go for help instead? None of these issues are addressed and essentially, having the investigators track their attackers back to their lair results in a ‘dungeon bash’ armed with hunting rifles and pistols instead of swords and spells. Also not addressed fully is what happens in the aftermath of the scenario – one element is covered in some detail, but little beyond that, and there is certainly no suggestion as to any Sanity rewards. 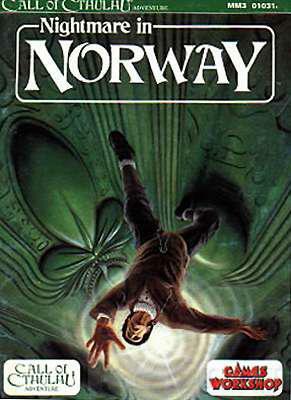 As a book, Nightmare in Norway is a slim thirty-six pages long. What makes it stand out is the sixteen-page insert that consists of the scenario’s few hand outs, 25mm scale floor plans the lodge, and a set of cut-out silhouettes with which to stage the threat’s strike upon the lodge. The illustrations are decent enough and the cartography is reasonable enough, although a map of the lodge other than the floor plans for the Keeper’s reference would have been useful. Ultimately, Nightmare in Norway is a magazine adventure given greater presentation, and not a great magazine adventure at that. Fortunately, Marcus L. Rowland would do better – ‘Draw the Blinds on Yesterday’ (White Dwarf #63) and ‘Curse of the Bone’ (White Dwarf #86) are both better scenarios. Nightmare in Norway as a whole focuses too much on the hunt and the shoot over the investigative process, the latter an aspect of the scenario that is underwritten and ill supported in terms of advice for the Keeper and NPCs that need further fleshing out. With some effort a Keeper could make more of Nightmare in Norway than the old fashioned Curate’s Egg that it is, but given Games Workshop’s possessiveness over its even unused intellectual properties, it is unfortunate that no one will have the chance to revisit it and address its problems professionally. I've always used 'Nightmare' as part of an on going campaign. The plot easily lends itself to a mid part adventure. The DM really can make this adventure work or it can break the adventure. As a stand alone its really alright depending upon what the PC's bring to the table. Its not bad really but needs some solid spicing up to really work. It could be fun to run Nightmare with Lamentation of the Flame Princess and to elaborate the creatures lair assault into a proper old school dungeon.